From 2006 to 2012, the Mac Pro from Apple stuck with the same aluminum case, first made popular by the Power Mac G5. Now, the Mac Pro returns with a completely redesigned look. Apple revisited the architecture of the Mac Pro's internal components in order to maximize performance and minimize heat. With a unified thermal core, Apple opted for a leaner, lighter, and quieter structure that was more streamlined. The unique cylinder design stands just 9.9 inches tall with a diameter of just 6.6 inches, which allows it to be a professional workstation that can actually sit on your desk. The system is powered by a 6-core 3.5 GHz Intel Xeon E5 processor. The Mac Pro also has 64GB of 1866 MHz DDR3 ECC RAM and 1TB of PCIe-based flash storage. There are also dual AMD FirePro D700 graphics cards with 6GB of GDDR5 discrete VRAM each. You'll be able to connect to the Internet with fast-speed 802.11ac Wi-Fi. The Mac Pro also supports a/b/g/n Wi-Fi networks as well. The Mac Pro also features built-in Bluetooth 4.0, which allows you to connect wireless headphones, keyboard, mice and other compatible peripherals without a hassle. 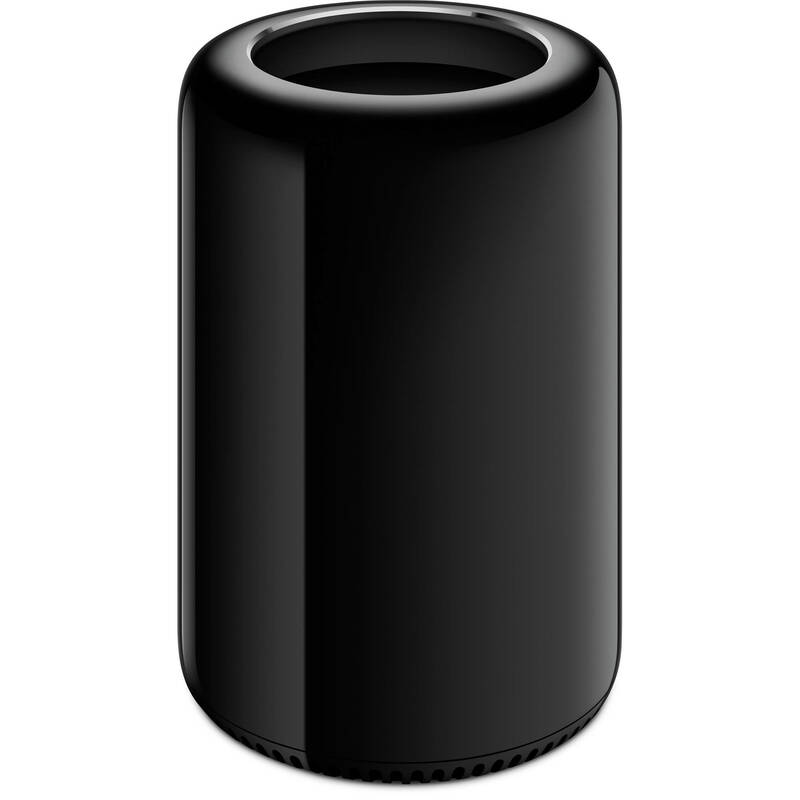 The Mac Pro has six Thunderbolt 2 ports and a high-speed interface that can move data at up to 20 Gb/s. That's four times the speed of the USB 3.0 standard. Speaking of USB 3.0, Apple added four USB 3.0 ports to ensure you have full native connectivity options with your USB-compatible peripherals such as external hard drives. iLife has a complete suite of digital creativity applications. Easy enough for anyone to use, iLife will help you edit your home movies, organize digital photos, and compose original music. iLife includes iPhoto, iMovie, and GarageBand. iWork provides three apps to keep you productive. Pages allow you to make creative word documents. Numbers helps you make spreadsheets more visually insightful. Keynote allows you to create a powerful presentation, complete with animated charts and interactive tables with cinematic effects and transitions. Thunderbolt 2 combines PCI Express and DisplayPort into one high-speed, versatile I/O technology. Thunderbolt 2 delivers twice the throughput, providing up to 20 Gb/s of bandwidth to each external device. So you're more than ready for the next generation of high-performance peripherals, without being limited by the number of expansion slots inside your computer. You can connect massive amounts of storage, add a PCI expansion chassis, and work with the latest external displays - including 4K desktop displays and peripheral devices capable of broadcasting in 4K. And since each Thunderbolt 2 port allows you to daisy-chain up to six peripherals, you can go all out by plugging in up to 36 external devices via Thunderbolt 2 alone. Mac Pro supports a total of two DVI or HDMI displays when connected via the built-in HDMI port or using the Apple Mini DisplayPort to DVI adapter. To connect additional DVI displays, use an active DVI adapter such as the Apple Mini DisplayPort to Dual-Link DVI adapter. You can connect up to six active adapter DVI displays. This requires a powered USB hub since Mac Pro offers four USB ports and you will need six to connect them all. Box Dimensions (LxWxH) 11.2 x 9.9 x 9.9"
Mac Pro Desktop Computer (Six-Core, Late 2013) is rated 4.5 out of 5 by 2. Rated 4 out of 5 by Pro Editor from Nice machine! I would have given 5 stars if I could get it with Yosemite installed instead of El Cap! It's cute, quiet and FAST! I got around El Cap with an alt boot partition on my raid, but sure would have been nice to be on the SSD. So far running Media Composer, Photoshop After Effects and Word all at once and no real slow downs. ProTools LOVES this machine as well. Once my software catches up to El Cap I'll probably be even happier, but for now this still really cool. Rated 5 out of 5 by Edu from Solid and fast. I use this for audio production with Logic Pro X and Pro Tools. Since I work with a lot of Virtual Instruments, I was looking for an insanely fast and powerful computer and the new Mac Pro delivered. I ordered the version with 64GB RAM and 1TB SSD and it worthwhile. Huge upgrade from my previous Mac Pro (Quad 2.66). It's very small and dead silent. Mavericks boots in 5 seconds. Can't say anything bad, so far.